Organocatalysis, that is the use of small organic molecules to catalyse organic transformations, has been included among the most successful concepts in asymmetric catalysis and it has been used for the enantioselective construction of C-C, C-N, C-O, C-S, C-P and C-halide bonds. Since the seminal works in early 2000, the scientific community has been paying an ever-growing attention to the use of organocatalysts for the synthesis, with high yields and remarkable stereoselectivities, of optically active fine chemicals of interest for the pharmaceutical industry. 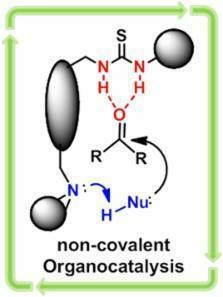 A brief overview is here presented about the two main classes of substrate activation by the catalyst: covalent organocatalysis and non-covalent organocatalysis, with a more stringent focus on some recent outcomes in the field of the latter and of hydrogen-bond-based catalysis. Finally, some successful examples of heterogenisation of organocatalysts are also discussed, in the view of a potential industrial exploitation. The advent and development of organocatalysis. The use of small organic molecules as catalysts has been known for more than a century. But only in the past decade has organocatalysis become a thriving area of general concepts and widely applicable asymmetric reactions. Here I present my opinion on why the field of organocatalysis has blossomed so dramatically over the past decade. Asymmetric catalysis by chiral hydrogen-bond donors. Hydrogen bonding is responsible for the structure of much of the world around us. The unusual and complex properties of bulk water, the ability of proteins to fold into stable three-dimensional structures, the fidelity of DNA base pairing, and the binding of ligands to receptors are among the manifestations of this ubiquitous noncovalent interaction. In addition to its primacy as a structural determinant, hydrogen bonding plays a crucial functional role in catalysis. Hydrogen bonding to an electrophile serves to decrease the electron density of this species, activating it toward nucleophilic attack. This principle is employed frequently by Nature's catalysts, enzymes, for the acceleration of a wide range of chemical processes. Recently, organic chemists have begun to appreciate the tremendous potential offered by hydrogen bonding as a mechanism for electrophile activation in small-molecule, synthetic catalyst systems. In particular, chiral hydrogen-bond donors have emerged as a broadly applicable class of catalysts for enantioselective synthesis. This review documents these advances, emphasizing the structural and mechanistic features that contribute to high enantioselectivity in hydrogen-bond-mediated catalytic processes. Copyright statement: © 2014 C. Palumbo and M. Guidotti.